The presence in the summer cottage of the greenhouse allows you to grow various crops. Many amateur gardeners do greenhouses of different shapes with their own hands. With its arrangement a very important issue is the ventilation system. To date, the issue of ventilation can be solved in several ways, besides, most of them will not require large financial and time costs. 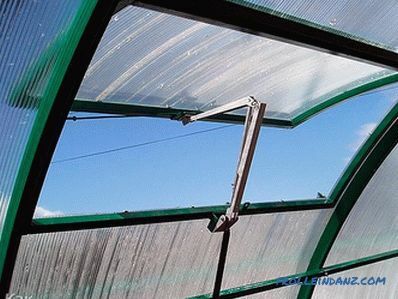 Thus, the best option is automatic ventilation, which will allow the system to independently regulate the opening and closing of windows in the greenhouse. 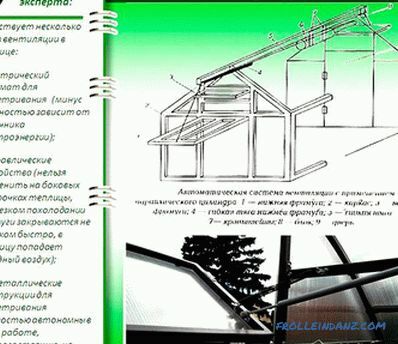 Automatic ventilation of the greenhouse with their own hands is easy to perform. Enough to read this article until the very end, stock up on tools and material, and also make a little effort. To organize natural ventilation it is enough to equip several windows. Regulation is determined by the degree of opening. During the construction of the greenhouse, everyone can independently choose the number, size and location of the vents not only in the walls, but also in the roof. This option is suitable for small greenhouses. An important issue in natural ventilation is to determine the time allotted for ventilation. It will depend on the ambient air temperature. 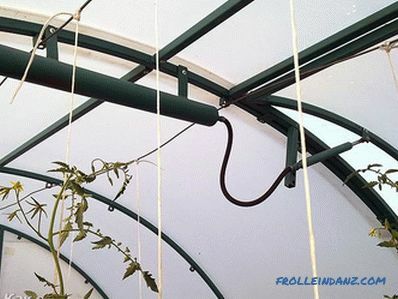 For arranging forced ventilation in a greenhouse, special electric fans are used, which force air. 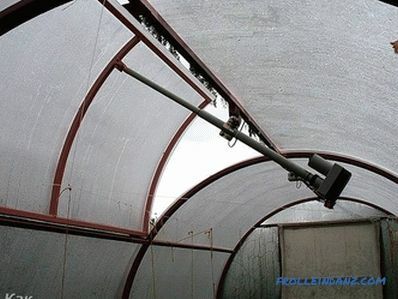 Forced ventilation in large greenhouses or complexes involves the use of fans for air recovery. The automatic ventilation system is designed to open and close windows automatically without human intervention. The best option for any summer resident is an automatic complex that monitors and carries out not only airing, but also watering, lighting, and heating in the winter. This allows you to grow crops with minimal time costs. The whole structure is designed using sensors and relays. You can find such systems in specialized stores or they are made to order. Self-production will require a lot of time, effort and additional special elements. the ability to design your own hands without large financial costs. The first option involves the use of gases and liquids that expand when heated from high temperatures in the greenhouse. 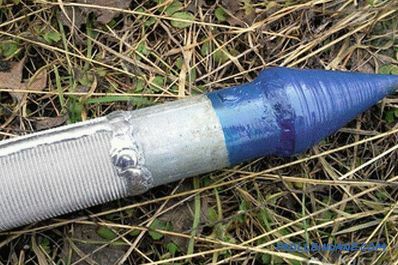 As an expander, you can use: water, engine oil, paraffin, freon or compressed air. 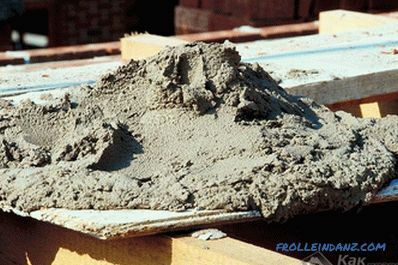 They are classified as available materials. In the second version, the properties of the two materials are used, which change their length differently during heating. The metal plate will expand with increasing air temperature, and when cooled, the reverse process will occur. It is more expedient to install electronic systems in large greenhouses, where they grow vegetables and fruits for sale all year round. The advantages of hydraulic ventilation systems are enough to make a choice in their favor. So, airing is quite simple to do with your own hands and as a result to get a reliable and powerful system that will last more than one year. The basis of the whole mechanism includes a system of levers that are equipped with sensors and connected to the windows. The principle of the hydraulic system is as follows: when the weight on the lever arm changes, the rocker bends and opens the windows. When the temperature cools, the reverse occurs. In the role of levers are 2 containers that are connected by a hose. The first tank should be inside the greenhouse, and be filled with air - act as a thermometer. The second container is fixed outside, as it plays the role of weights. When the air is heated, the fluid will be pushed out and move. The container inside the greenhouse must be heated by the temperature of the air, and not by sunlight. Not knowing how to make a simple automatic airing of the greenhouse with your own hands from improvised means, it suffices to read this section. So, the most common way is iridescent vessels. Anyone who decided to facilitate the ventilation process in the greenhouse can create them. No special knowledge or skill in locksmithing is needed. All elements are safe, and the resulting system will not require constant adjustment. 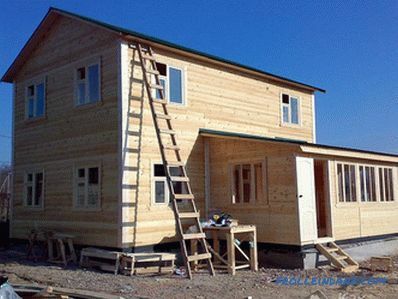 When selecting containers it is necessary to take into account the weight and size of windows. For small windows fit plastic bottles of 6 and 2 liters. A large bottle is an expansion tank that must be hermetically sealed with a sealant. In the cover set the fitting, which put the hose. Before this, 1.5 liters of water is poured, as 3/4 of the total volume must be filled with air. The same procedure is used for a small bottle. Pour a small amount of water so that it covers the edge of the overflow pipe. The expansion tank is installed at the place where the air temperature is determined (most often under the roof), and also as close as possible to the window that will open. A small bottle is hung on the top of the transom frame. The principle of operation is as follows: the heat will cause the air inside the tank to expand, which will cause the water to be squeezed out into a small bottle. Increasing the weight will cause the window to open. When the temperature drops, water will flow back through the hose and the window will close. When creating automatic ventilation using the method of overflowing vessels, it is important to check the tightness of the joints from time to time. If this indicator is broken, the system will stop working. First of all, you need to pick up all the tools and materials, including a canister (metal), a cylinder (like a glass), an inflatable ball, foam plastic and a metal rod, a hose for connection (rubber), cord for bowstring, pulley (bobbin of sewing machine), yoke (metal), glue, sealant, adhesive tape. Receiver. To get a large amount of sunlight it is worth painting over the canister with black paint. A hole is drilled in the cap into which the rubber hose is inserted and firmly fixed with a sealant. Cylinder. Cellular polycarbonate may be suitable for its manufacture. 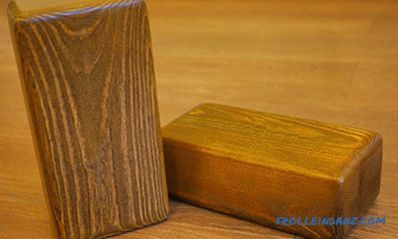 The edges are glued with special glue. Thus, there should be a glass with a bottom in which a hole for the hose is also drilled in the middle. As is the case with the receiver, everything is treated with a sealant. A hole is also made in the cylinder head for the stem guide to be inserted. For ease of use of the ventilation system, the cover should be removable. Pneumatic piston. The end of the tube, which is inside the cylinder, is covered with scotch tape. Put on a balloon and fix at the point of connection. It is important that all elements are sealed tightly, otherwise the system will not work. The inner diameter of the glass is cut circle from the foam, it should move freely up and down. 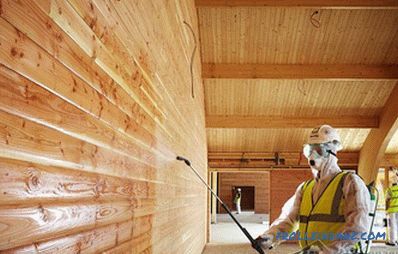 To reduce the friction force, the walls are coated with petroleum jelly. To the prepared circle from polyfoam fix a metal rod. Build the system. In the role of the rocker serves a metal plate at the edges of which there are holes.The axis can be represented as an ordinary nail, on which the rocker is attached. Under the ceiling of the greenhouse (here is the highest temperature) fix the canister. Near the transom fix cylinder. On the wall of the greenhouse strengthen pulley. To the window, which will automatically open, pass the string through the pulley from the rocker arm. When the air in the canister warms up, it will go into the cylinder and inflate the ball. The piston and the rod under pressure will rise up, the string will stretch and the window will open. Thanks to the constant aeration in the greenhouse, the plants will not wither, as the air temperature stabilizes and is as comfortable as possible. Because of the high temperatures, crops will not be able to bear fruit and will die quickly enough. It is quite simple to create a primitive system of automatic ventilation, besides, this will not entail additional and unintended costs.